MOSCOW, August 13. /ITAR-TASS/. The intercontinental submarine-launched ballistic missile Bulava will be launched in September or October, a source in the Russian naval headquarters familiar with the process said on Wednesday. The missile will be launched from Borei-class strategic missile submarines Alexander Nevsky and Vladimir Monomakh, the source told ITAR-TASS. Vladimir Monomakh was initially planned to shoot Bulava in August or September, the lead vessel Yuriy Dolgorukiy - in November, while Alexander Nevsky was not planned to participate this year. 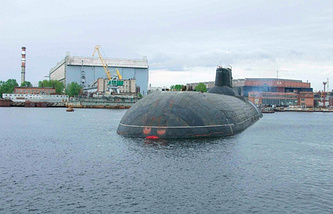 Alexander Nevsky is the first serial Borei-class submarine and began service in 2013. Vladimir Monomakh is planned to join the fleet in late 2014. Alexander Nevsky and Vladimir Monomakh were earlier reported to make three test Bulava launches from the Sea of Okhotsk in the summer or autumn of 2015. For this, the submarines would follow the Northern Sea Route with 16 missiles each, said a source in the governmental military-industrial commission. 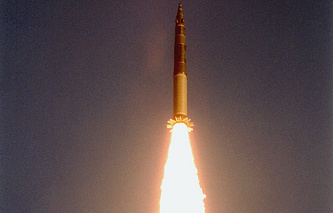 The military planned a total of five test launches, Deputy Defense Minister Yuriy Borisov said. Bulava R-30 is the Russian state-of-the-art three-stage solid-fuel missile that carries up to 10 independent warheads and has a range of 8,000 kilometers (5,000 miles). The missile aimed to equip two strategic submarines Shark and Borei has been developed since 1998. On September 6, 2013, Alexander Nevsky launched Bulava in the White Sea at the Kura test range in Kamchatka. The rocket left the launch container but a malfunction occurred in the second minute of flight. According to the governmental commission, the failure resulted from a mistake in nozzle material production. Bulava launches would be resumed in the autumn of 2014, Borisov said later.